Blueprint Films (2002-2006) was a cooperative of filmmakers that I co-founded in Portland, Oregon with my good friends Jainee Dial and Vincent Caldoni. In 1998, at the age of 23, I moved across the country from New Jersey to Portland and started producing 8mm & 16mm shorts with friends I made through the Northwest Film Center. In 2001 as digital tools were becoming more accessible to indie filmmakers I set out to produce my first feature length “film” titled bluestar which I shot on a tiny handheld Canon Optura PI digital camera and edited on a new NLE suite that had just come out called Final Cut Pro. 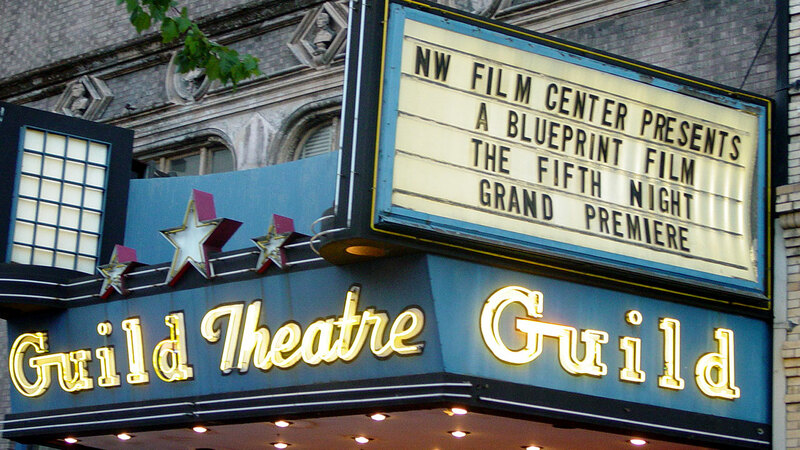 In June of 2002 I premiered bluestar at a small indie theater on Portland’s east side to an audience of about 80 people. It was my first movie premiere and we dressed up and rolled out a red carpet and everything. It was awesome. After bluestar, anxious to get started on my next project, I did what every young ambitious filmmaker did in those days, I marched down to my local camera store and maxed out a credit card on a brand new Canon XL1S to shoot my next film. Over the following six months I wrote, cast, directed, shot, edited and produced my second feature film the fifth night which premiered at the Guild theater in July of 2003. Over 200 people attended the fifth night premiere and to this day I’m still so thankful to the friends who flew across the country for the event, the amazing donors who helped me finance the project and to everyone everywhere who made that project happen. While working on the fifth night I started taking classes at the Art Institute and it was there that I met fellow filmmakers Jainee Dial and Vincent Caldoni. Jainee was producing these absolutely beautiful music videos and Caldoni was working on a screenplay for a project that would eventually become the accordion. The three of us quickly became friends and started pooling our resources and helping out on each other's projects. One afternoon the idea came up to formalize ourselves into a loosely bound collective and blueprint films was born. In the spring of 2004 I created a website and edited together a reel of our work to generate excitement for our upcoming release of the accordion that summer. On September 30, 2004 we threw a party for over 500 people at the Bossonova on E. Burnside to showcase independent filmmaking in Portland and celebrate the premiere our first collaboration, the accordion. It was an absolutely incredible event and I look back proudly at what we were able to accomplish that summer with the support of our friends, families and the local film community. Over the next two years blueprint films continued to produce a series of short films, features, music videos, commercials, documentaries and PSAs some of which are available on this site. Then in October of 2005 while shooting my short film a promise to the disappeared I was struck with the sudden death of my father. When I returned to Portland after the funeral I brought my cast and crew together to try to complete the film which was already mired in challenges but my heart wasn’t in it. I trimmed the script and dropped scenes just to get through it and with the support of some very good friends was able to limp through post-production. I screened the film to a small audience of close friends the following spring shortly after my 30th birthday. This past October marked the 10 year anniversary of my father's passing and I haven't made a film since. After the promise screening I edited together another reel of the projects we had produced over our four years of working together as sort of an anthology I could remember us by. My parents celebrating my fourth birthday can be seen at the beginning of the video. When I tell this story, people often ask me if I miss making films. What I say is that what I miss most is the special kind of collaboration the medium provides. When a film is well produced it brings together talented strangers from so many different walks of life to participate in the telling of a story they all identify with. The result is a special gathering of people with unique and complimentary skill sets who actively want to get to know and learn from each other. Furthermore a well produced film creates a protective environment that allows the filmmakers to open up and be themselves without fear of judgement or condemnation. The sense of security facilitates open, honest and intimate relationships which often result in lifelong friendships. Making movies is unlike any other experience in the world. And yes I miss it. However I am in another phase of my life now, one where I enjoy building tools to help other people express themselves and tell their stories. That is not to say I’ll never make another film. Life can take a massive unexpected turn at any moment as I learned on that terrible night in October of 2005 and anything and everything remains possible. Still I look back on those years collaborating with Jainee and Caldoni and the rest of the blueprint films family and I’m thankful for what I learned, for the opportunity to tell our stories, for everything everyone shared with us and for how those incredible years shaped who I've become.